When I set up the Ireland’s Wildlife Facebook Page in 2009 and launched this website in May 2011, the intention was to create an independent hub for informative and engaging Irish wildlife and nature content on the web. Up until now that has been achieved with no external investment, on a purely voluntary basis with a meagre budget. I’m quite proud of what we’ve achieved… but I’m under no illusion. It could be much, much better. And that’s what this post is about. 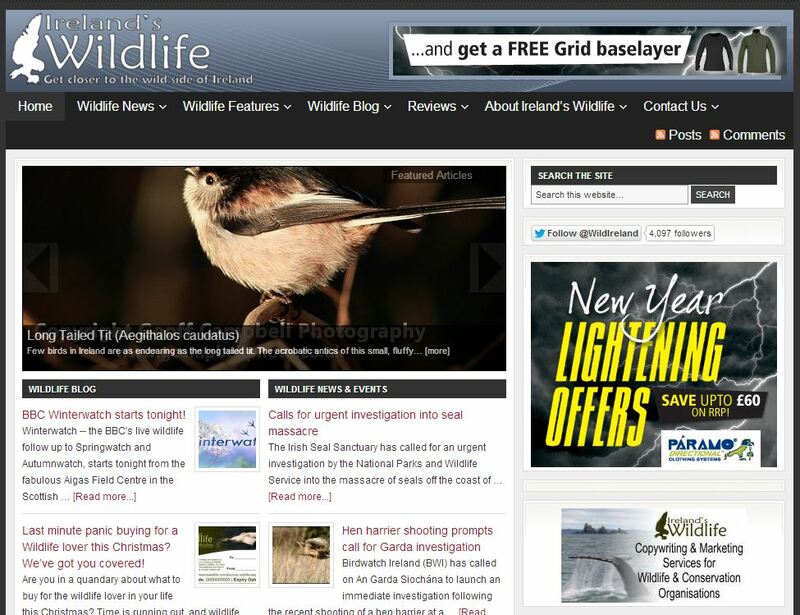 Making the Ireland’s Wildlife website and associated online community a better resource for everyone. I have plenty of ideas for how we can make that happen, but all of them demand more time, resources and, let’s face it, money. None of which are readily available. So it’s time for Ireland’s Wildlife to start paying its way — to become self-sustaining, and give me the scope to dedicate time and allocate the resources that it both needs and warrants. That’s why you’ll see a few new options under the “About us” link in the menu bar. Corporate Sponsorship: Ireland’s wildlife is about encouraging conservation through engagement. Our corporate sponsorship option gives larger businesses the opportunity to sponsor sections of the site, and provides us with the resources we need to reach more people with high quality willdife content. None of these options will materially affect the way content is delivered on the site, or your day-to-day use of the site, but together they can hopefully generate enough revenue to cover the cost of running and maintaining the site as it continues to grow. With a bit of luck they’ll go a bit further than that, and allow us to re-invest in developing the site into the content-rich wildlife resource it’s always had the potential to become. If you know of a wildlife related business that could benefit from advertising on Ireland’s Wildlife then please pass on the link. Likewise if you know of someone who looks after the Corporate Social Responsibility Programme for a larger organisation, and think they could be interested in sponsoring Ireland’s Wildlife, again, please pass on the link. Together we can all help make Ireland’s Wildlife better. Hi Calvin, just to say I really enjoy your tweets and other content and the site is marvellous. These are certainly challenging times for most people but, generally, I think people are happy to support causes close to their hearts. – Think about getting involved in “The Gathering”. You are probably aware that it’s a government initiative and they are really pushing it. There’s a coordinator for Cork county- all details on their website. Promote wildlife outings as part of reunions etc. (obviously for a fee). I feel we will see a lot of movement this year. I myself am in the early stages of organising an family reunion in Clonakilty in August and if I succeed I will certainly propose such a delight. -Secondly, ask your followers to sponsor some specific initiatives or to make a small donation towards your costs. People do it all the time for eg The Donkey Sanctuary. Donations for Wildlife in lieu of birthday presents etc. .
-Finally, set up a way of enabling people to gift Wildlife weekends/outings directly from the site. That’s about it- hope I’ve given you food for thought- maybe these are only naive ideas and subject to a lot of red tape about which I know absolutely nothing! Hi Geraldine… thanks for the comment, kind words and suggestions. I just thought a post was in order to explain the ads and the slightly more commercial focus of some areas of the site this year. I’m not asking for direct support from the Ireland’s Wildlife community… I firmly believe the site has the potential to sustain itself. All I’m really asking for is a helping hand in getting the word out about the advertising and sponsorship opportunities. Will look into the other suggestions.